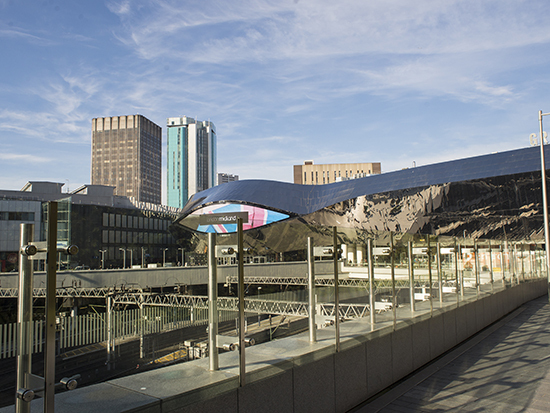 As the busiest railway station outside London and the busiest interchange station in the UK, Birmingham New Street is used by over 170,000 passengers a day and serves as the first, vital impression of Birmingham city to many of its visitors. With the growing footfall and prestige of the station, Network Rail had planned a £750M redevelopment to provide better access, spacious platforms and leisure areas, better facilities and a bright, modern design in keeping with this important city. Throughout the 450,000 sq ft project, designed by renowned architects AZPML, glass is used extensively to maximise light and space. Kite Glass were selected because of our vast experience dealing with the demands on quality, technical ability and service that these large infrastructure projects demand, working for the main contractor, Kite Glass provided specialist structural and curved glass for many parts of the station, including canopies, balustrades, stairways and shopfronts. Both heat-treated toughened laminated glass and decorative glass (specifically ceramic screen-printed glass).